What a wonderful weather we had for the long weekend in Rehoboth Beach, DE! And, the class was even better. Nancy Cucci taught bead basics (I’d never applied beads to needlepoint before) & darning patterns (which I had not done very much of before). So, it was a wonderful learning experience. I am also very impressed by her instructions. All the images are hand drawn. I thought everyone used a computer & was thrilled to learn she does them by hand. They are so well drawn that I didn’t realize that they are hand drawn! Such a personal touch to be doing it by hand. We applied various types/sizes of beads the first day. Then, yes, I finished 2 areas of the beading at a bar! 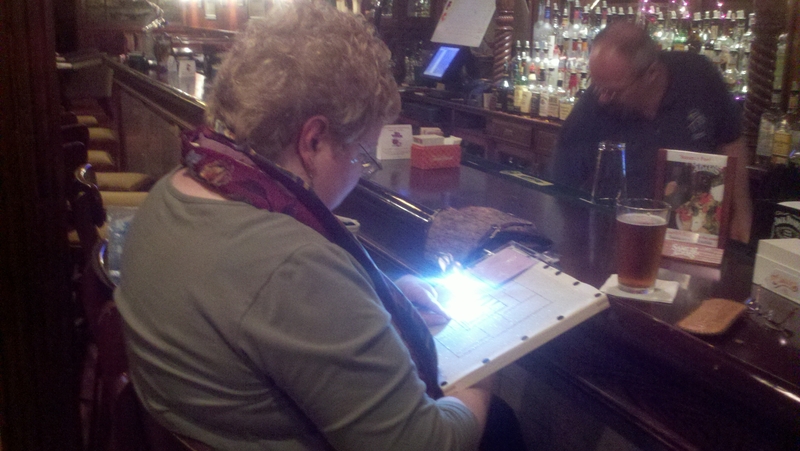 It was so well-lit & almost nobody in the bar that it was like working at home with just the TV on – baseball, beer & beading with Bill by my side!! The second day we learned about the background stitches (some darning others more wrapping to create flatter/rounder looks) & a way to sign & date the piece in a very subtle stitching pattern. We talked about all the areas before we left. There were 2 ladies that came from Albany, NY & 4 of us from Philly, & the rest were Delawareans. It was really a wonderful opportunity to meet fellow ANGers. Most everyone went out to a group dinner on Monday night, including the 2 traveling husbands. Roseanne & Geri did a fantastic job at organizing everything. It really was a wonderful group of people, location, & learning experience. Thanks again for thinking to invite us! And, on the drive home, I came up with an idea for a piece to submit to ANG Seminar for 2012. I even got the basics down on paper last night when I got home so I wouldn’t forget. I was picking her brain about how she designs during class. Thanks Nancy for a very educational & enjoyable learning experience!! And, eventually, for a loving piece of needlepoint. My pre-work for Nancy Cucci’s ‘Stitches in Sterling’ is all ready. We outlined the project in tent & slanted gobelin using Kreinik braid & ribbon. It took me a little longer than 4 hours so I am really glad I got it done before class. That way, as Nancy says in the instructions, we can focus on attaching beads the entire first day. I’ve not done much with beads except the little Mill Bead Kit ornaments done on perforated paper. That was one of the reasons I decided to take the class. Roseanne, the Vice President/Programs Chair, and Geri, secretary, of the ANG DE Seashore Chapter drove up to our chapter last spring to see if anyone was interested in joining them for a 2-day class. They meet in Georgetown, DE, approximately 15 miles from Rehoboth Beach and Lewes, DE. And, 4 of us decided to take the class. Nancy taught this first in Tucson in 2006. Here is a brief description from the 2006 seminar brochure. 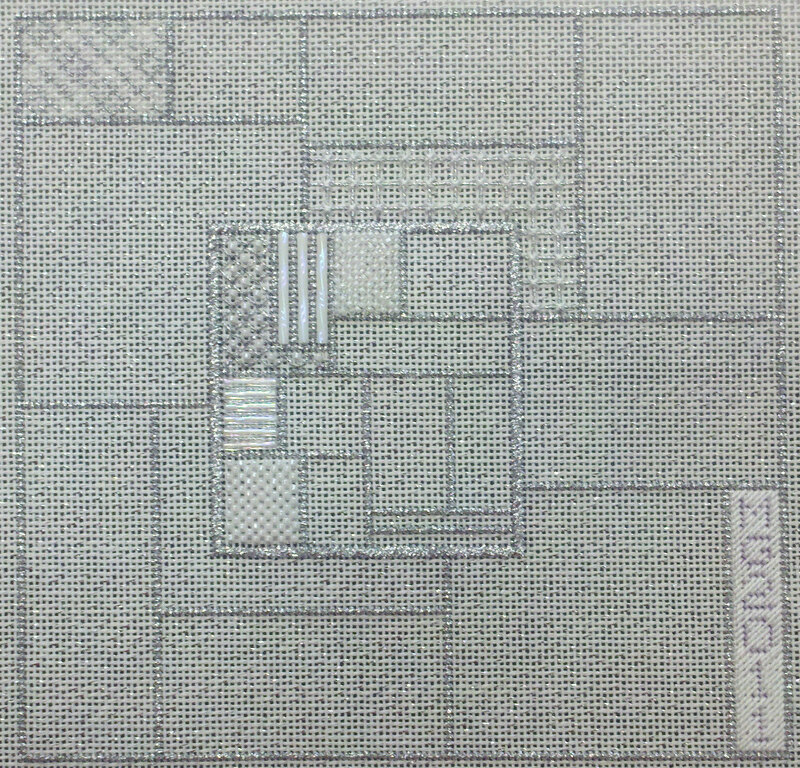 Stitched on 18 count canvas, Stitches in Sterling is a version of silver and white with touches of crystal and iridescence. 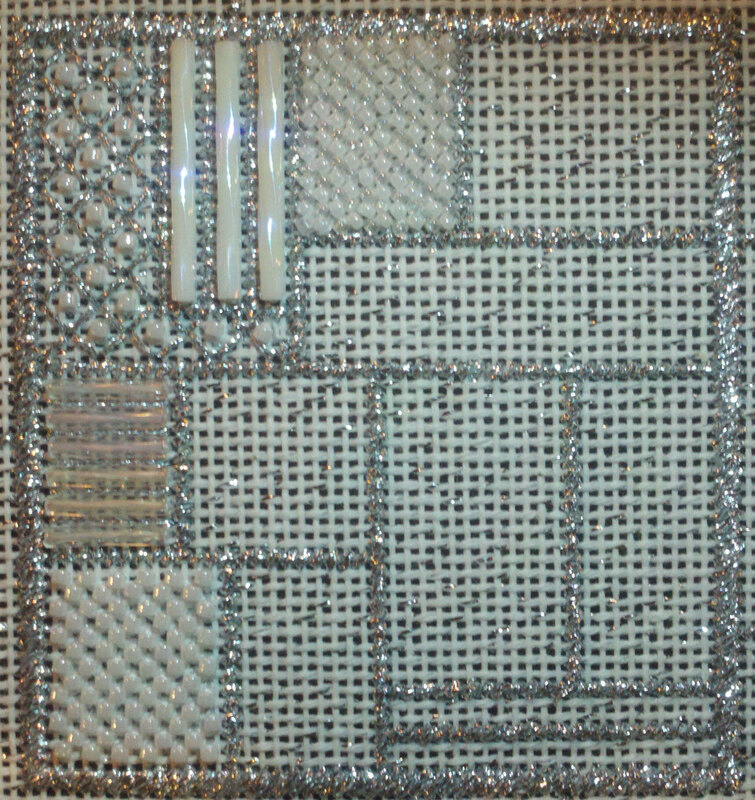 The focal point of this sampler is a beaded center area consisting of samples of patterns stitched with a variety of beads accented with a Swarovski crystal. The collection of boxes surrounding the beaded area contains sheer background stitches that enable the canvas to sparkle through the needlework. 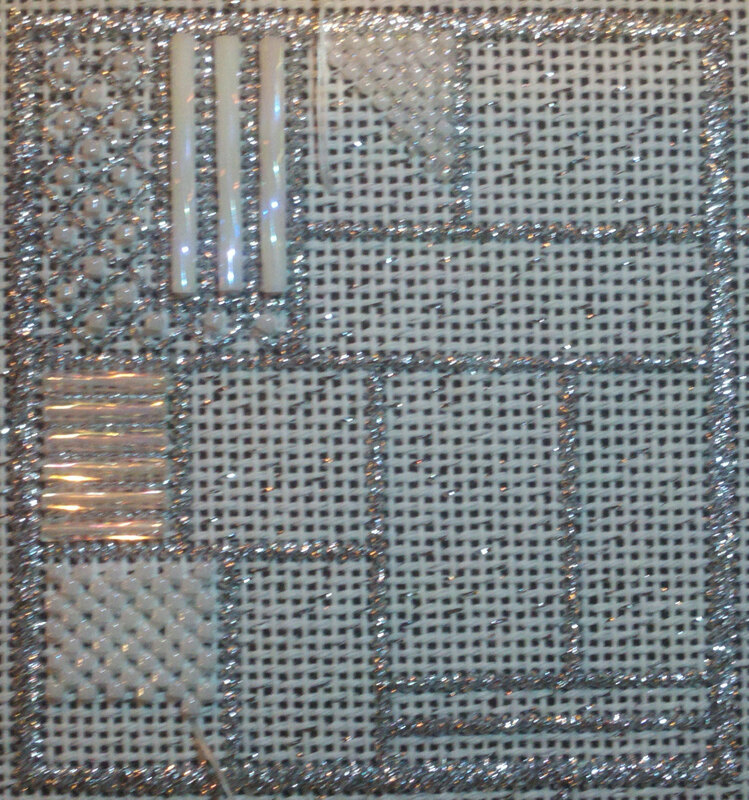 Stitched with metallic thread, white pearl cotton and a variety of white, crystal and iridescent beads this project emphasizes pattern and texture. 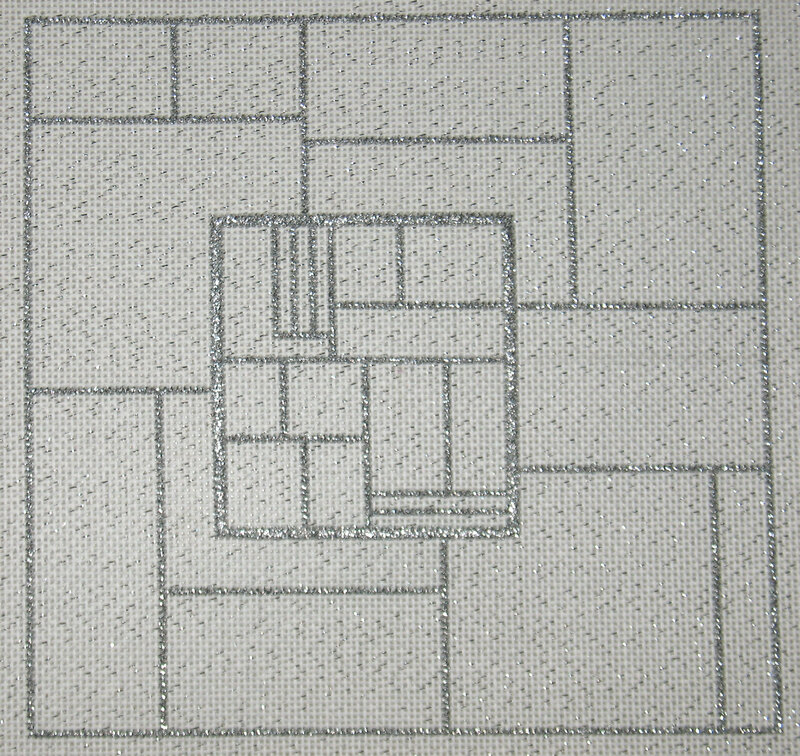 Design area is 7″ x 7″. My husband wasn’t going to go until I told him I found a great deal for a room at Rehoboth Beach at the Atlantic Sands on the boardwalk with a balcony & oceanfront view! It’ll be about a 30 minute drive to the class but I love the opportunity to be oceanfront.